First flight of the 737 MAX. Boeing successfully conducted the first flight of its newest aircraft type, the 737 MAX. The two hour, forty-seven minute test flight, took place on 29 January when a 737 MAX 8, powered by CFM LEAP-1B engines, took off from Renton Field and landed at nearby Boeing Field. Since Southwest Airlines launched the program with an order for 150 units in December 2011, Boeing has taken orders for a total of 3,072 MAXs. The 737 MAX is not going to be carrying much cargo, but it will replace thousands of 737NG aircraft, particularly 737-800s, which will become strong candidates for conversion to freighter configuration. Video of the first flight is not yet available for download, but you can view it on Boeing’s website. 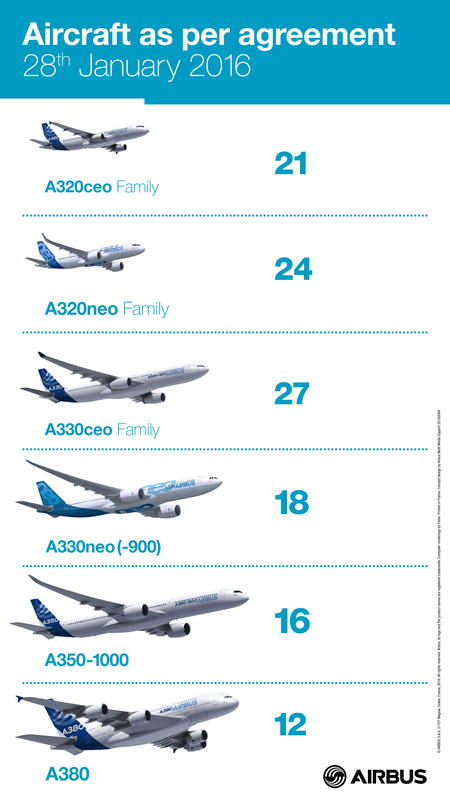 The breakdown of Iran’s agreement to purchase 118 Airbus aircraft. Now, turning to Airbus, the big news is an order from Iran for 118 aircraft, made up of seventy-three widebodies (including twelve A380s) and forty-five narrowbodies. However, “Iran orders 118 planes from Airbus” is one of those headlines that needs to be followed with a careful reading of the story. As is now well known, the UN-imposed sanctions related to Iran’s nuclear program were recently lifted, and airlines, forwarders, trade delegations, and manufacturers from countries all over the world have rushed to re-launch their business ties with Iran. So what is the catch? The catch is that one country, the United States, has not lifted its own sanctions, and any country or company that does business in the US has to be very careful about doing business with Iran. In this case, problems include the fact that some parts for Airbus’ aircraft are manufactured in the US, and also that financing for the deal will have to be arranged without any use of the US financial system. Nonetheless, it is a significant order, and one that Boeing missed out on because it is, at present, not allowed to do business with Iran. Back to Boeing now, with an order only it could receive – a contract from the US government for the new “Air Force One.” However, as is the case in the Airbus order above, there is a catch. The US government has not ordered two 747-8Fs to replace the aging Air Force One fleet of two 747-200s, but rather awarded Boeing a contract to start preliminary work on two new Air Force One presidential aircraft based on the 747-8. And while the government has budgeted $1.65 billion for two specially configured replacement aircraft, the initial contract is worth just $25.8 million. It is almost a sure thing that Boeing will eventually receive an order for two 747-8 aircraft for the Air Force One fleet, and $1.65 billion is a tidy sum, but without some significant commercial orders, the 747-8 program is in jeopardy. All Nippon Airways ordered three A380s. Airbus again, but still on the subject of commercial orders for huge aircraft, the European manufacturer booked an order for three A380s from Japan-based All Nippon Airways. Not a huge order, and probably discounted as part of the deal Airbus reached with ANA over the restructuring of failed Japanese low-cost carrier Skymark, but, combined with the twelve units ordered by Iran, a much-needed shot in the arm for the A380 program. A KC-46A refuels an F-16C during the first refueling test flight. And finally, back to Boeing, and another first flight – this time the first full refueling flight for the KC-46A tanker. For more on that story, see 767 Renaissance, posted last week. Its a privilege to be updated particularly in the aviation industry, the current development on the production of the now generation aircraft such as those of the Airbus Industries and Boeing. Relatively, its direct implication not only on the passenger side but also on the cargo side as these two aspects determine the profitability of its operations notwithstanding the ebb of fuel nowadays. Your timely information matters. Thank you!